Here at Broder Metals Group, we like to do our bit for the environment. 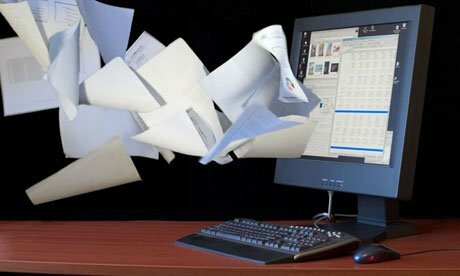 We recycle our paper waste, we use printers capable of printing double-sided, we have smart plugs fitted to various electrical devices and of course our computers are energy efficient models, locally purchased from VeryPC of Sheffield. Future plans also include energy efficient lighting in the warehouse and offices, and an upgrade to our electric meters to enable us to monitor our electricity usage. However, one big change we made last year was the move to a paperless order system. Although our stock system held copies of order details and invoices, other documents like the customer’s purchase order and our delivery paper-work could not be incorporated and so every order was accompanied by a large brown folder holding all the paper-work. As a result, we were using over 10,000 pieces of paper (and several ink cartridges per month), with a large proportion of this going into storage (and held for up to eight years). In September 2013 we decided that this had to stop. Having created a set of rules for the correct storage of files to enable their quick (online) retrieval, we went ‘live’ with the paperless system on 1st October 2013. So far, it has been a huge success, as explained below. Given the levels of traceability required for our products, particularly ones like Alloy 718 to the API6A 718 specification, paper records are just as important an asset to the business as our steel stocks, and yet they are not given nearly as much attention. We have business recovery plans in place to deal with situations like fires and floods which would get the business back up and running if the worst happened but none of these would previously given us a way of retrieving our historical records, other than the basic order information held within our stock-system. As well as saving all new sales orders from 1st October, we are currently working our way through the hundreds of boxes of order packs dating back to 2004, scanning each order record onto the shared server. As UK customers will know, we have geared ourselves up for speed of reaction – on quoting and delivery on a same day / next day basis. If you are one of the many customers who have now signed up to receive your order documentation electronically, then you’ll know that we have added speed to our back-end processes to deliver documentation in advance of delivery wherever possible. For those who haven’t, by saving electronic copies of the order paperwork we are now able to send a copy of the delivery note, your material certificates and invoice directly to you along with a confirmation that your order has been despatched. This means that there is no chance of the carrier losing your paperwork and delaying you booking the material in and getting to work on it for your customer. Another major benefit to both us and our customers through holding electronic records. These are accessible by the Sales and Quality staff instantly, so whenever a customer phones up to request copy documentation or has a query relating to the order, there is no longer a delay caused by finding the location of the pack and sorting through a ream of paper. After the first six months of operating the paperless order system, we predict that it will save about 5-6% on our annual non-payroll overheads, through the reduction in paper, ink cartridges and storage boxes required. If you want to know more about how we achieved this please ask when you place your next order!